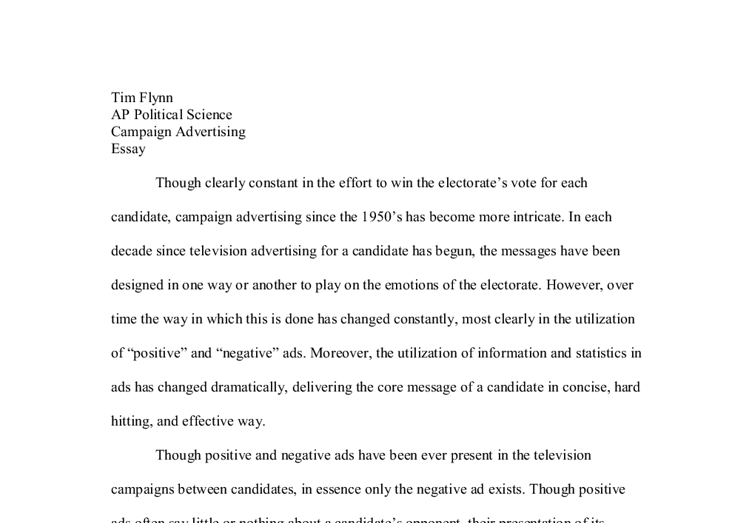 Tim Flynn AP Political Science Campaign Advertising Essay Though clearly constant in the effort to win the electorate's vote for each candidate, campaign advertising since the 1950's has become more intricate. In each decade since television advertising for a candidate has begun, the messages have been designed in one way or another to play on the emotions of the electorate. However, over time the way in which this is done has changed constantly, most clearly in the utilization of "positive" and "negative" ads. Moreover, the utilization of information and statistics in ads has changed dramatically, delivering the core message of a candidate in concise, hard hitting, and effective way. Though positive and negative ads have been ever present in the television campaigns between candidates, in essence only the negative ad exists. 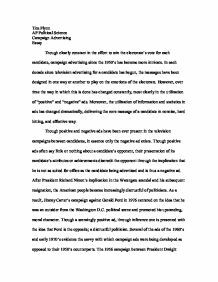 Though positive ads often say little or nothing about a candidate's opponent, their presentation of its candidate's attributes or achievements discredit ...read more. In addition to the types of advertisements, the content of modern campaign ads have changed over time. These ads blend truths or partial truths and emotional sentiments to elicit the desired response (a vote for the candidate being advertised). These ads have also been present since the 1950's but have intensified over time in the juxtaposition of visual and audio imagery, and the "fact" being stated. They have progressed from the "Eisenhower Answers America Campaign" where perhaps an incisive comment about how the Democrats before him raised taxes was elicited by the President, to President Lyndon Johnson's ad against Barry Goldwater that displayed a map of the United States where the eastern seaboard was being cut-off by a saw. This imagery, both audio and visual, was accompanied by a narrator's quoting of Goldwater saying he wished the eastern seaboard could be sawed off and let drift into the ocean. ...read more. Though the aim of every campaign ad had has remained constant, the methods used in realizing that aim have changed drastically. Television advertising is a reflection of social mores and it plays on whatever the current concerns of the customers are. To sell a product, no one technique has ever been constant, if such were the case the method would become stagnant and the product would not be bought. Therefore, as society develops and changes, so too does the advertising marketed to satisfy it. The development of campaign ads has been no different. They have gone from utilizing cartoons and campy humor, to playing on the electorate's greatest fears and concerns. The only true constant in campaigns as in anything is change, and as the electorate is fickle in its needs and wants, one can be assured the advertising or campaign to reach them will change too. ...read more. Women deserve the same amount of respect as any other human being upon this earth. If they are trying to advertise towards younger males with this, why don't they have men wrestle and advertise towards younger women? Obviously it is because of who they are targeting. Retail (local) Advertising Retail advertising is directed not only at selling a product, at encouraging the buyer to purchase it at a specific store. The national advertiser sells its products at any location. Retail advertising must give the consumer a reason to purchase at a single store. Principle 2: What are the actual effects of the advertisement on individuals and on society as a whole? Effect on Desire ? Principle 3: Does the advertisement inform or does it also seek to persuade? ? Principle 4: If it is persuasive, does it attempt to create an irrational and possibly injurious desire? However, she finds a friend, a young man, dressed as a Pepsi outside a nearby store. Then, they walk off holding hands. In "Vacuum", comedian Dave Chappelle drinks a Pepsi while waiting for his date. When an electronic, roving vacuum tries to get at his can of Pepsi, he refuses to give it up.